Although the quests in Drasilmarsh starts at LvL 21, the entry allowance is LvL 20. The recommended average LvL of the group to go to Drasilmarsh is 22-23, simply because the last boss is LvL 25 and can hit quite hard lower LvL players (lets say LvL 20). The dungeon itself has 4 different floors/levels. As the party enters, the players should take a turn to the right to go to 4th floor. 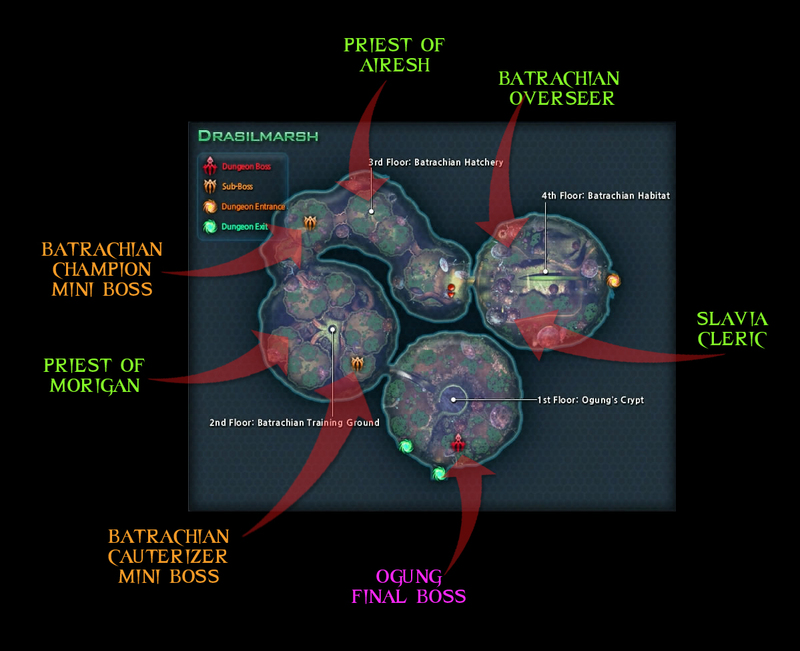 Besides the kill tasks quests which involve to kill trash mobs at this state, the party need to kill the Batrachian Overseer and Salvia Cleric in order to continue deeper into the dungeon. All the encounters including in the 4th Floor are tank n spank. Once Batrachian Overseer and Salvia Cleric are dead, the party can head back to the dungeon’s entrance, from where they cross over the green leaf bridge. Side Note: If the group skip the Overseer and the Cleric at 4th Floor, the entrance after the green leaf bridge will be blocked. So they need to kill those 2 mobs in order to progress further. As the party moves to 3rd Floor, they will face another cleric, the Priest of Airesh. Again this mob is tank n spank encounter with no special moves or anything else. Right after this cleric, it comes the 1st mini boss; the Batrachian Champion. He is also a tank n spank encounter with no special moves besides his summoned clone. At 17k health, he will summon his clone who has almost half the HPs from the mini boss. The tank should pick him pretty easy and the encounter can finish pretty smooth. At the 2nd Floor there are 2 routes. The one on the right leads to another cleric, Priest of Morigan who sometimes drops a blue item. He is just an elite mob with no special moves or anything else, again tank n spank. The left route leads to the 2nd mini boss of the dungeon, the Batrachian Cauterizer. This mini boss is again tank n spank, but bear in mind his powerful cleave attack. For this reason, it’s recommended for the dps group members to stay behind him all the time. A cleave attack which delivers moderate dmg to everyone in a cone sight in front of him. Once the mini boss is dead, the party needs to head back to the entrance of the 2nd Floor and go down the wooden hole which leads to the 1st Floor. If the party LvL is about 21-22, watch out the 1st pull of trash mobs of this floor. Two patrols moving along and also 2 groups of trash mobs are located very close to each other, which can cause aggro threat to dps or healers. Finaly, when the party reaches Ogung, players need to be cautious about the poison DoT (dmg over time) on the entire floor. This DoT cant be removed, but if players stand on big green flowers, the DoT won’t effect them. It’s recommended for healers and ranged dps to stay on flowers so the medic will have easier job to keep the tank alive. Also, if the tank wishes to avoid the DoT he/she can do so, by standing on a flower left of the boss as he/she face him. Ogung uses 3 different spells in entire encounter. Besides his basic attack he casts an AoE water attack around him which can be interrupted. This AoE attack is quite devastating by delivering high amount of damage in 3secs. There is also an animation about this spell, by putting his staff into the ground and starts channelling his attack. At some point, more than once, he will summon his minions to aid him. At this point AoE dps and the tank with AoE taunt need to pick them up fast, before they swarm the healer. Especial in low LvL group, priority have the minions over the boss because if they don’t get killed quickly, Ogung will summon more. Ogung’s encounter doesn’t require any movement at all, if the party has positioned itself correctly prior the attack. Side Note: Along the entire dungeon, there are some ghostly animals moving around with low HP. They drop some nice blue items sometimes, so it’s recommended to kill them fast once you spot them.